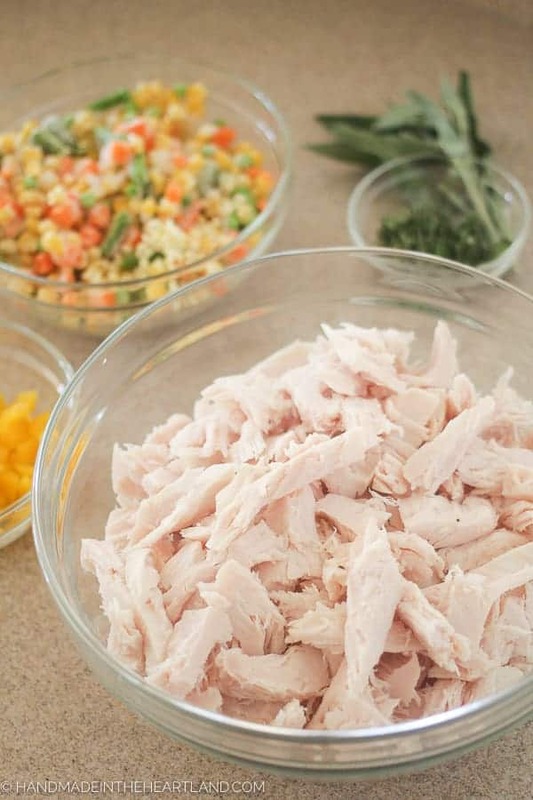 This easy turkey a la king recipe is going to be your new favorite leftover turkey recipe or your new go to easy weeknight dinner made with deli turkey. I’ve got all the tips for how to make the best turkey a la king. 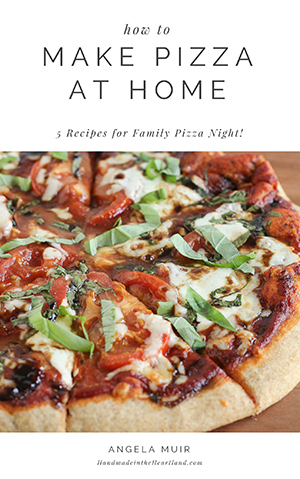 I knew this recipe was going to be a winner but it was confirmed to me by my friend Melissa. I dropped a container with the filling and a pie crust off to her a few days ago, she has a new baby. She texted me the day after her family ate it and asked for the recipe, that’s my cue to put it on the blog! 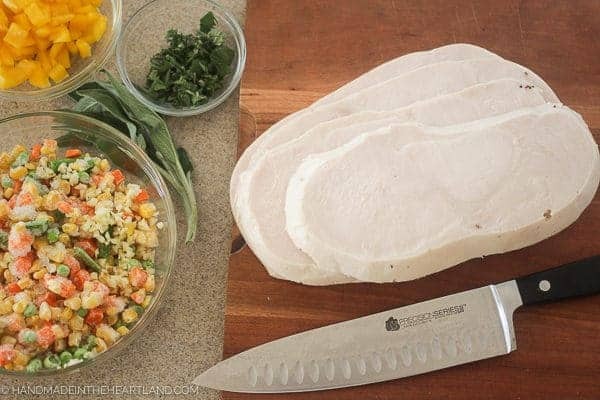 This recipe is perfect for leftover turkey from Thanksgiving however it’s January and I’m not about to cook up a whole bird and honestly I didn’t really want to cook a turkey breast either so I used a shortcut. I was worried it wouldn’t work and I was pleasantly surprised. I went to the deli counter at my grocery store and picked a deli turkey and asked them to cut me thick slices- 5/8″ thick to be exact. When I got it home I shredded/tore it into pieces to mimic a cut up Thanksgiving turkey. Guys! It totally worked! There are a lot of things I like to make from scratch like whole wheat bread and tortillas, but for some reason I haven’t mastered biscuits yet. Thus I purchase the refrigerated can that pops and makes me jump every. single. time. 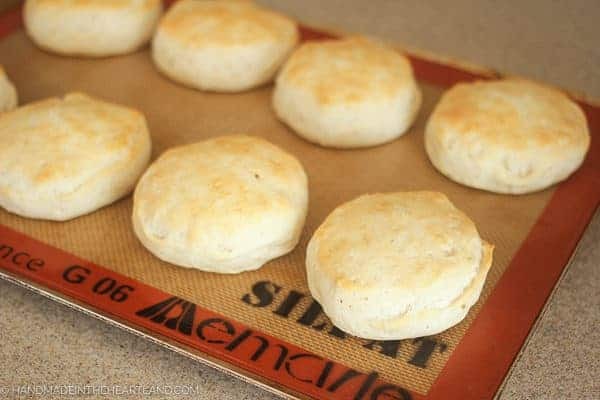 I’m adding biscuit making to my to do list for the next week. Do you have a favorite recipe I should try?! 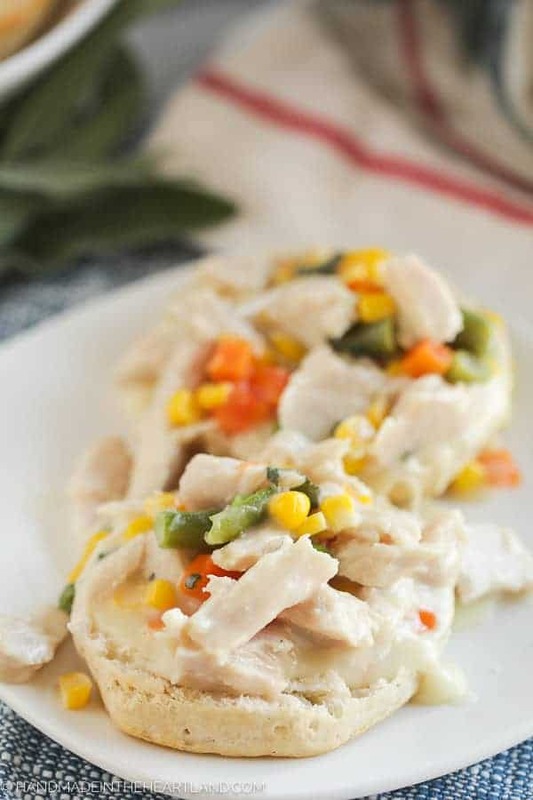 This easy turkey a la king recipe is so versatile. 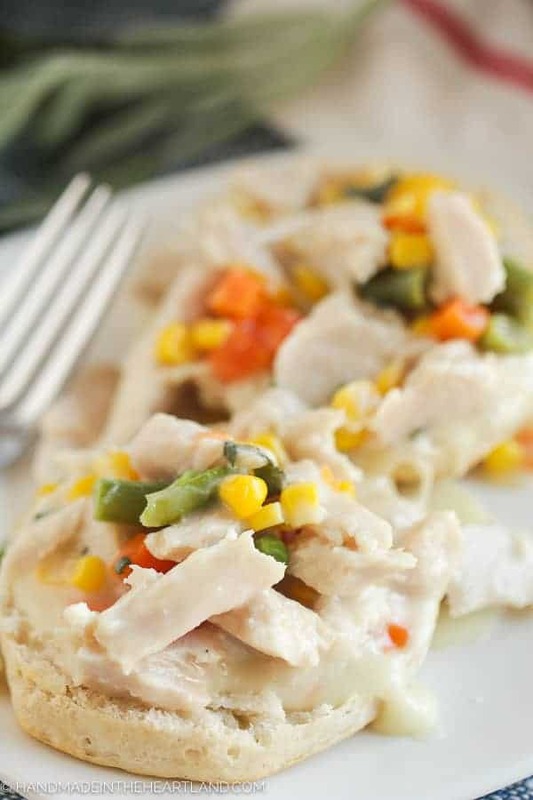 Traditionally turkey a la king is really chicken a la king and placed over toast, pasta or rice. I love this version served over a nice thick, flaky biscuit. yum. 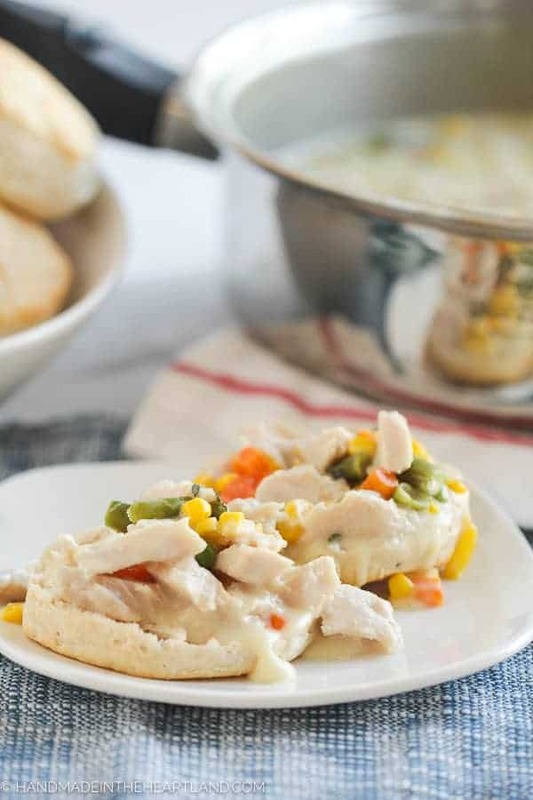 You can also put it into a pie crust and it's a turkey pot pie. I told you, so versatile! In a large skillet melt butter over medium-high heat. Add turkey, wine and a pinch of sage. Stir the turkey occasionally until it's browned, about 5 minutes. Remove from skillet and set aside in a bowl. Put the skillet back over medium heat and add butter until melted. Mix in flour with a whisk until it is combined into a paste- this is called a roux. Add in the chicken broth and heavy cream and whisk until the roux is thoroughly mixed into the liquid. Stir until starts to thicken, about 5-8 minutes. Add in the vegetables, turkey, sage and a splash of white wine, stir to combine. Put a lid on your pot and let simmer for 10-15 minutes. Check it occasionally to stir and make the heat isn't too hot where it would be burning the bottom. You want a nice slow bubble to create thickening but not a boil to burn. To serve cut the biscuits in half and spoon the mixture over the biscuits. 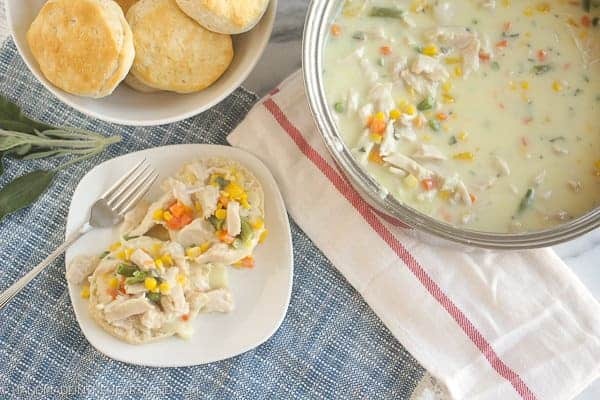 If you make this recipe I’d love to hear how you like it! Tag me on instagram @handmadeintheheartland or facebook ! Happy cooking friends!